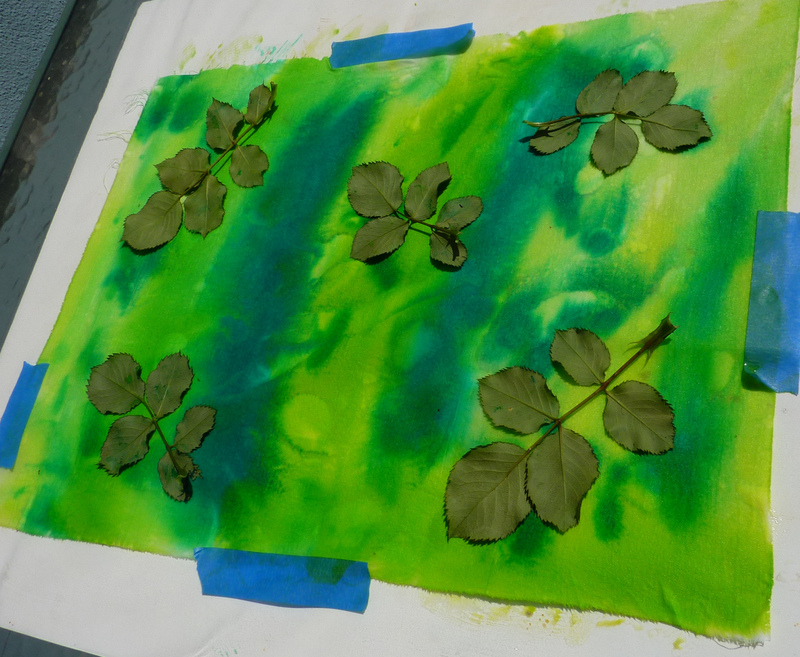 I love Sun Printing – the serendipity aspects are marvelous, especially using organic masks – you’re never quite sure how it’s going to turn out. And, if you don’t like the results just repaint your fabric and start over. a portable work surface: cover a piece of heavy cardboard with plastic and tape the plastic securely to the reverse side of the cardboard. The work surface should be a couple of inches larger than your fabric piece all around. Paint: sun sensitive fabric paint such as Dye-Na-Flow (from Lumiere) or light sensitive Setacolor fabric paint Use from 1 to 3 different colors. Use items that have enough weight to sit firmly on the fabric so that the sunlight doesn’t leak in under the edges in order to create a nice crisp print. Lighter items will give you a more subtle look. If there’s a light breeze you may want to place a weight such as a hardware washer on top of a mask that could blow away or shift position. (such as a leaf) A fine straight pin could be used to hold your item to the fabric as well. Just make sure that it doesn’t cast a shadow -unless you want that effect. 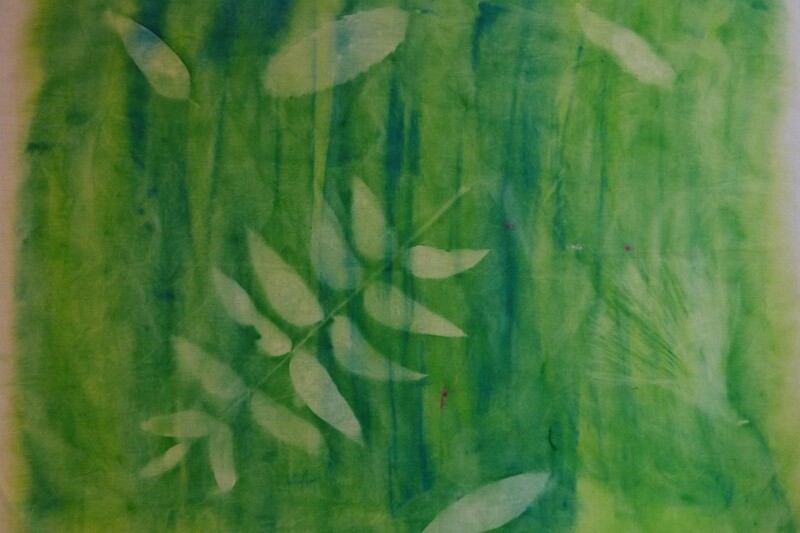 The paint used in Sun Printing works by seeking out a light source. So when you place a mask over a section of painted cloth, the paint will migrate into uncovered areas of fabric. shapes you cut out yourself from cardboard. 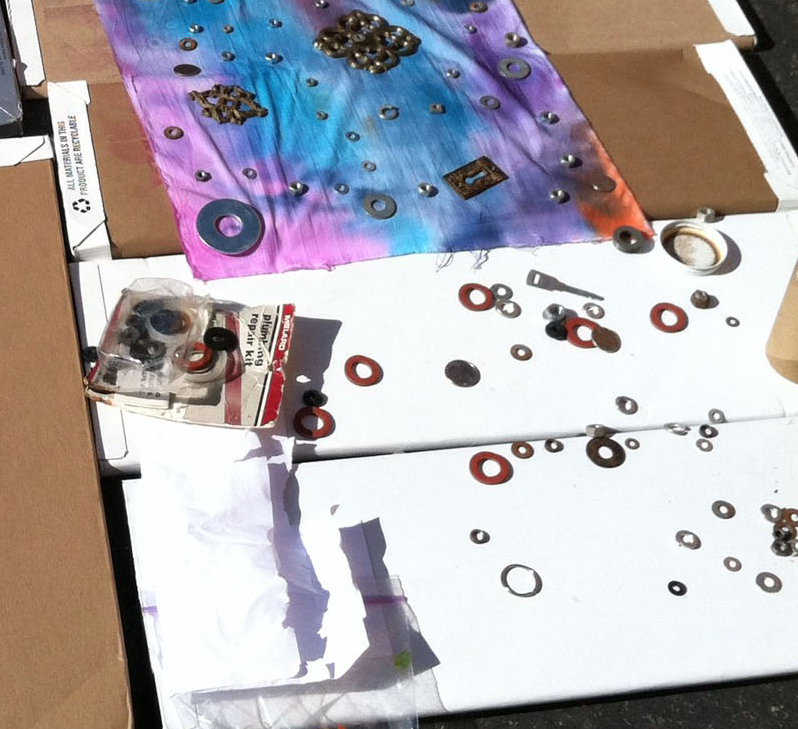 Secure your fabric to work board with pins or use masking tape to secure the edges. Wet down fabric thoroughly with water/spritzer bottle. Keep the fabric wet until you’ve finished arranging your design. Choose between 1 and 3 paint colors for your first project. Mix a small amount of each color with 2 parts water, placing one color solution in each bowl. 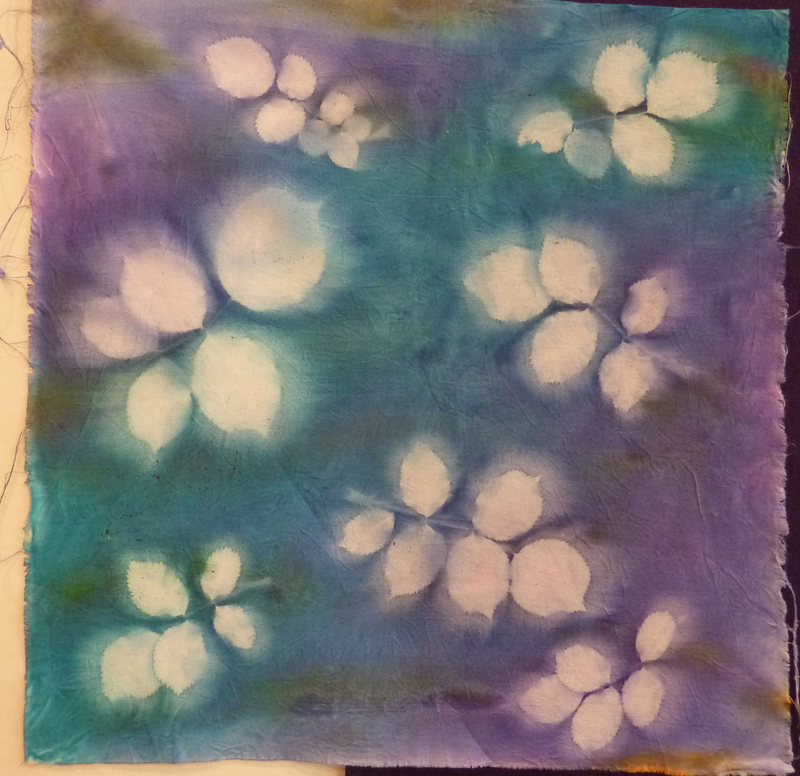 Wet foam brush and start painting fabric. Remember this is a background. It doesn’t have to resemble anything; it is simply a colorful backdrop for your printing items. While painting with color #1, leave white spaces for additional colors. 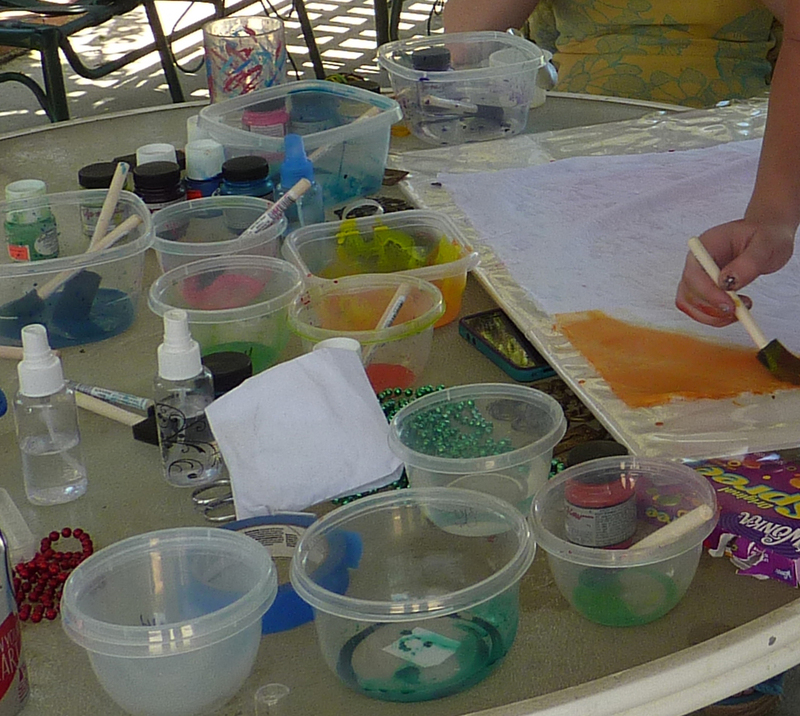 As you add your additional colors, spritz more water to help the colors spread and mix at the edges. 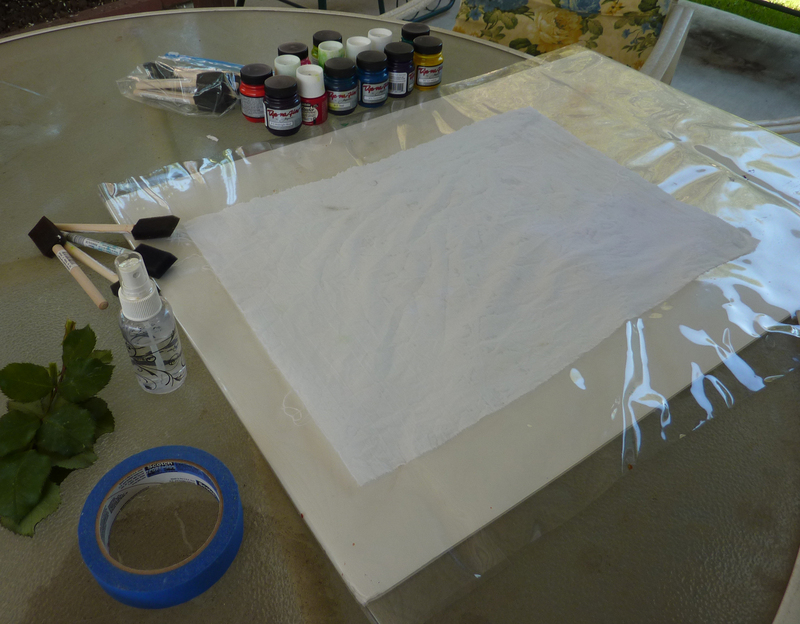 Have your masking items ready to arrange on your fabric immediately, especially if you are outside on a warm sunny day! 7. Quickly arrange masking items on to wet painted surface of fabric. 8. Take fabric – along with work surface to a sunny spot and allow to dry for 30 minutes to an hour – depending on temperature and humidity. 9. Remove masks when completely dry. 10. 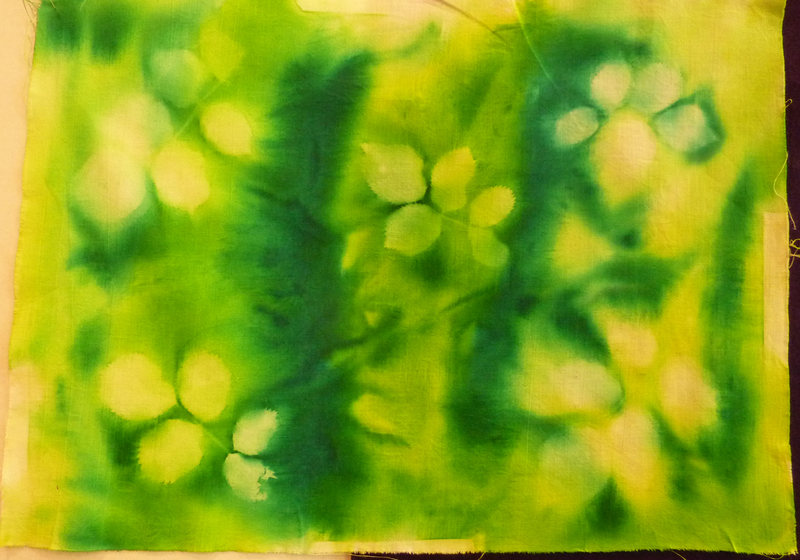 Press fabric with a hot dry iron for about 4 minutes to set the paint.